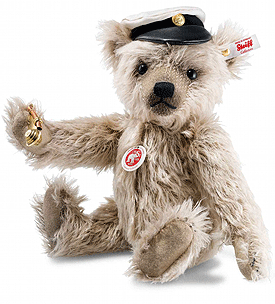 Captain Keith Teddy Bear by Steiff. A beautiful limited edition Steiff item, hand made in caramel mohair. He wears the famous Steiff Gold plated Button in Ear along with the White tag. At five in the morning, the sailors are awakened by a shrill whistle: Captain Keith Teddy bear is already on the bridge of the ship. Wearing a captain’s hat with a maritime metal button and holding a real sailor’s pipe of copper and brass in his paw, he wakes his crew for another busy day. The sailors adore their weathered furry captain – with his eagle eyes and calm hand on the tiller as they sail the seven seas. And you will too!